Volkmann Inc. announces the appointment of five new manufacturer’s representative groups to further strengthen and improve its sales and support activities throughout the U.S., Canada, and Mexico. The principals of each of these experienced powder processing sales companies recently attended a three-day product training seminar at Volkmann’s sales and testing facility in Bristol PA. The training used small group, hands-on principles to demonstrate the working equipment -- both in the lab and workshop -- covering lean, dense and plug flow conveying, basic fault finding, and fault correction. 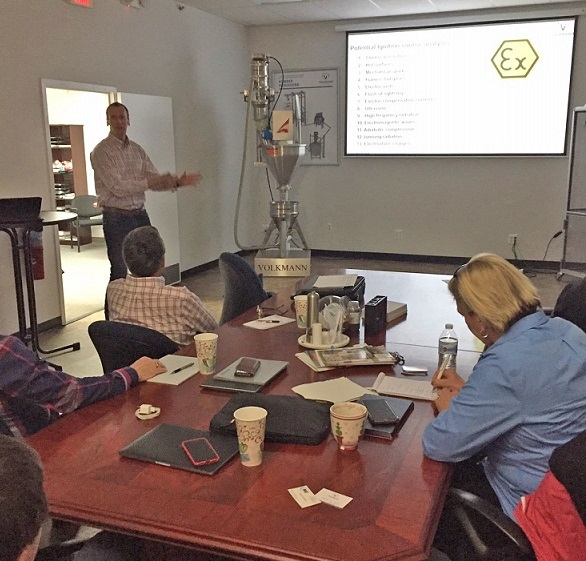 The training also demonstrated the essential sales feature advantages of Volkmann’s vacuum conveyors, bag dump stations, bulk bag unloaders, and purpose-designed additive manufacture metal powder handling systems.